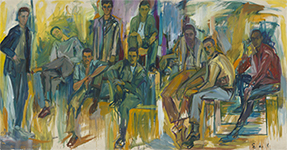 Elaine de Kooning’s gestural portraits of friends and family were much admired during her lifetime, and included such well-known Americans as poets Frank O’Hara and Allen Ginsberg, critic Harold Rosenberg, choreographer Merce Cunningham and painters Willem de Kooning and Fairfield Porter. De Kooning made both abstract and figurative paintings and drawings during the height of Abstract Expressionism in New York City. She is best known for her portrayals of men—Porter once commented that de Kooning’s images of men were “both sympathetic and frighteningly acute.” In her portraits, de Kooning sought and worked to capture the “instantaneous illumination” of recognition: What qualities beyond the attributes of the face make you recognize someone? She characterized her portraits of John F. Kennedy as “a glimpse” of the president through an accumulation of sketches and finished likenesses. Curated by Brandon Brame Fortune, the Portrait Gallery’s chief curator and senior curator of painting and sculpture, the exhibition is accompanied by a fully illustrated publication.